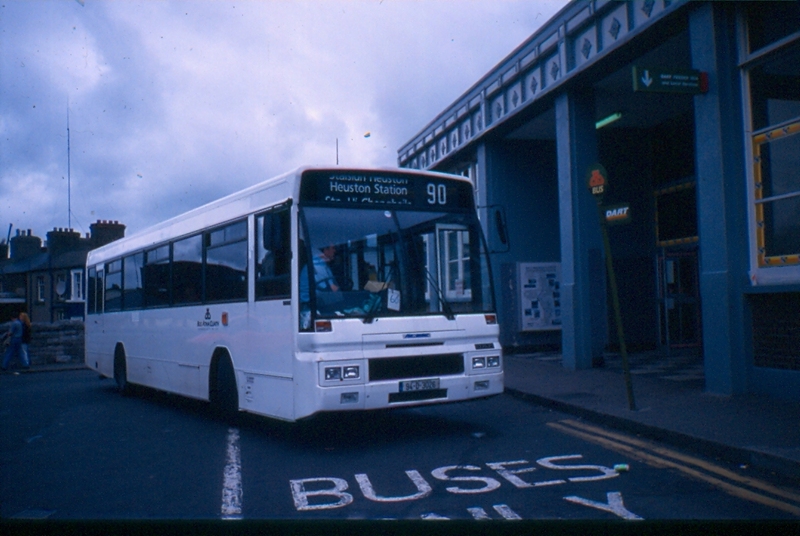 This week we jump back in time to 1994, and a time when Dublin Bus was taking a lot of single-decks into its fleet. In 1992/3 Dublin Bus had purchased a batch of 40 DAF SB220 single-deckers with Plaxton Verde bodywork, and in 1994 they followed this with a further 70 DAFs, this time with bodywork by Alexander. AD26 is seen brand new at Connolly Station, in plain white pending a decision on which livery it should adopt. The location of this shot no longer exists in this form – the ramp used by buses such as the 90 to access Connolly Station was excavated and the LUAS tramway platforms are now located here, but about 10-15 feet lower. This entry was posted in Monday Morning Classic and tagged Buses. Bookmark the permalink.